Hey guys!… I have collected some gaming accessories that have picked my interest and I think that you guys would love it too. 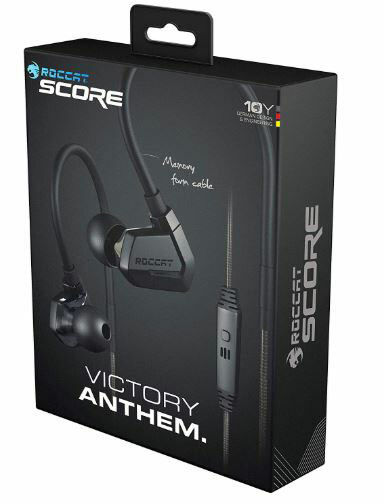 Now first up we have the Roccat score in-Ear gaming headset. Many of you may know that a good gaming headphone can make a huge difference in your game. But sadly, most gaming headphones tend to be bulky and they are not easy to carry around. But Roccat has came up with something that might be a perfect solution to that problem. The Roccat score isn’t in your headset, but it is a little larger than most in your headsets due to the larger buds, but that is most likely to accommodate the dual drivers. Since these are a bit larger, they have included adjustable ear hooks, and this not only helps with keeping them in place but also helps with comfort on the cable side of things. There is a built in omni directional real voice Mic and a mute button and the body can also be used to play, pause and skip music and you also get a PC adapter that splits the end into an audio and Mic jack and you also get a nice and convenient carrying pouch. The sounds these produce are just amazing. The drill drivers work in perfect harmony to create an amazing audio. The bigger driver focuses on the base and the mids and highs are handled by the smaller one. The ranges are distinct and the basis good for gaming. Next up we have the Mpow gaming headset. As for me Bose headphones, these gaming headphones are really good at many departments. 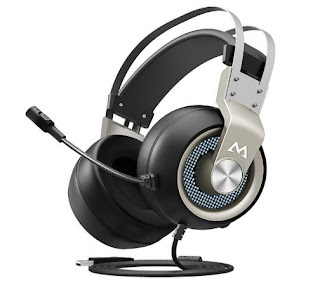 It comes with 7.1 surround sound 15 millimeter drivers, noise cancellation mic over the ears, earmuffs and amazing LED lights on the side here and the design is really cool and unique and these are crafted for long gaming sessions. The LED lights as a cool atmosphere to your gaming experience and the 7.1 virtual surround sound reflects the in game environment so you can hear and detect your enemies and incoming threats. The Omni-directional and flexible microphone picks up sound with great sensitivity and headphone is also easy to adjust volume with the mute control house on the mic. Now, next up we have the Roccat Vulcan 120 Aimo Keyboard. The Vulcan combines an aluminum coded chassis with elevated key gaps to make it a product that looks striking. You can see the RGB lighting through every key switch, not just through a tiny ledger on the key gap. But when the keyboard is all lit up, it’s hard to take your eyes off it. There’s also a mute button and a dial which you can use to control either the volume or the illumination level. Titans switch” tactile like a lot of in house keys from high end keyboard manufacturers. You can also reprogram any key and tweaked lighting on the device which is a nice touch. And the keyboard lets you program macros and even activate game modes which disable certain keys that could take you out of a game such as alt+tab or the window button and have to say this springy, responsive keys were a boon across all gaming genres. All in all, the keyboard is amazing. It’s build quality lighting, responsive keys, that makes it a tough competitor across this price range. Now for a keyboard that is just a little friendlier on your wallet. We have the Gamenote mechanical gaming keyboard. Now this keyboard is not that cheap. It’s actually $80. And you might think that spending this much, but this keyboard offers more features than you think. 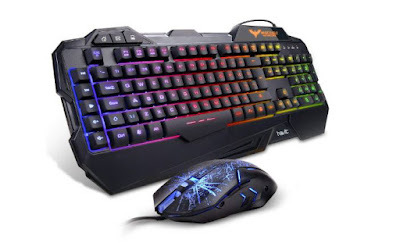 First of all, it is RGB backlit and you can change the colors to your liking. The design is simple. So it’s great for portability and it features the latest Kyla blue switches which is very tactile and response. 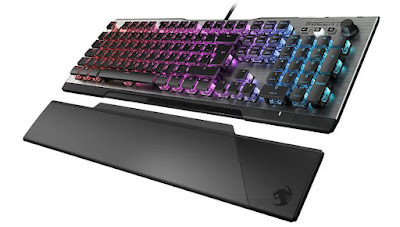 If the keyboard has also got thinner keys so you will take less time and effort to press a key and gaming on this keyboard is a great feeling the keys are easier to reach and press faster. So for competitive games this keyboard will be great.